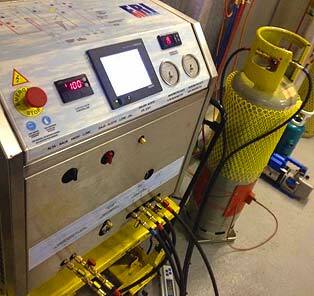 Business Edge was asked to carry out cleansing works, employing the Fri3Oil system, on an indoor evaporator and inter-connecting pipework to a replacement outdoor Airedale condensing unit. Liquid HCFC R22 was injected into the system in sufficient quantity to raise the liquid level inside the system, in order to achieve liquid return to the Fri3Oil machine. The refrigerant acted as a carrier, raising all system contaminants (oil, acid, water, etc) to the surface until gravity forced all unwanted particulates and chemicals into the intermediate R.E.A. Receptacle. The refrigerant was drawn back into the refrigerant cylinder, until 100% vapour was detected at the inlet to the Fri3Oil machine. Once this had been acheived, the cleansing process then began.